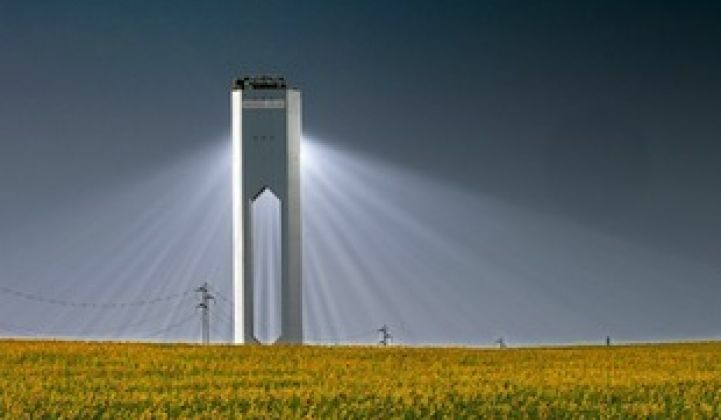 The Palen CSP project is being revived by Abengoa. Now with thermal storage. We recently reported on the proposed Palen Solar Electric Generating System and its potential to be the last concentrated solar power (CSP) project to ever be approved and built in the U.S. In September, the California Energy Commission approved the Palen Solar Power Project, after scaling down the concentrated solar project from two 750-foot, 250-megawatt towers to one tower on a smaller piece of real estate. Then we reported that the project was not to be built -- Palen Solar Holdings had formally withdrew its petition, according to KCET's website. The sole developer will now be Abengoa, which will use a molten salt thermal energy storage system in the design. Abengoa will have to submit its new plans to the CEC. The Mojave Desert plant, built with the aid of a $1.6 billion federal loan guarantee, kicked off commercial operation at the tail end of December 2013, and for the eight-month period from January through August, its three units generated 254,263 megawatt-hours of electricity, according to U.S. Energy Information Administration data. That’s roughly one-quarter of the annual 1 million-plus megawatt-hours that had been anticipated. Output did pick up in the typically sunny months of May, June, July and August, as one might expect, with 189,156 megawatt-hours generated in that four-month period. But even that higher production rate would translate to annual electricity output of less than 600,000 megawatt-hours, at least 40 percent below target. Another sign of the plant’s early operating woes: In March, the owners sought permission to use 60 percent more natural gas in auxiliary boilers than was allowed under the plant’s certification, a request that was approved in August. Danko reports that a Platts article "broke new ground when it highlighted Federal Energy Regulatory Commission reports on second-quarter electricity sales from Ivanpah’s three units (from Units 1 and 3 to PG&E, and from Unit 2 to Southern California Edison; they can be seen here, here and here). The sales totaled 133,807 megawatt-hours, and at an average price of $167.85 per megawatt-hour, that generated $22.46 million in revenue." "That relatively small output, combined with the project’s $2 billion price tag, could no doubt hurt all three Ivanpah owners. But BrightSource, despite having the smallest stake -- 20 percent, according to Platts, compared to NRG’s 50 percent and Google’s 30 percent -- might suffer the most as it tries to sell its technology in a market where cheap and bankable solar PV appears to be winning the day," wrote Danko. The CEC's preliminary decision acknowledged that the Palen project will cause "significant unmitigated impacts to biological, cultural, and visual resources," but suggests that the benefits outweigh those environmental issues. CEC staff have reported that Palen will pose a greater risk to bird life than BrightSource's Ivanpah project. Firms such as Areva, Siemens, Sopogy and Infinia have exited the CSP business. Abengoa still maintains that declining capital costs and improved efficiency levels will make CSP competitive with combined-cycle gas turbines on cost, efficiency and utility by 2020. Other CSP firms include eSolar, which has attempted a pivot to enhanced oil recovery (see GlassPoint), along with BrightSource. GTM Research solar analyst Cory Honeyman said in an earlier email, "The outlook for CSP remains uncertain, given the technology's limited cost reductions and the early-stage permitting challenges seen over the past few years. Meanwhile, utility-scale PV projects have pushed the boundaries of competitive pricing for solar, with contracts signed between $50 per megawatt-hour and $70 per megawatt-hour."